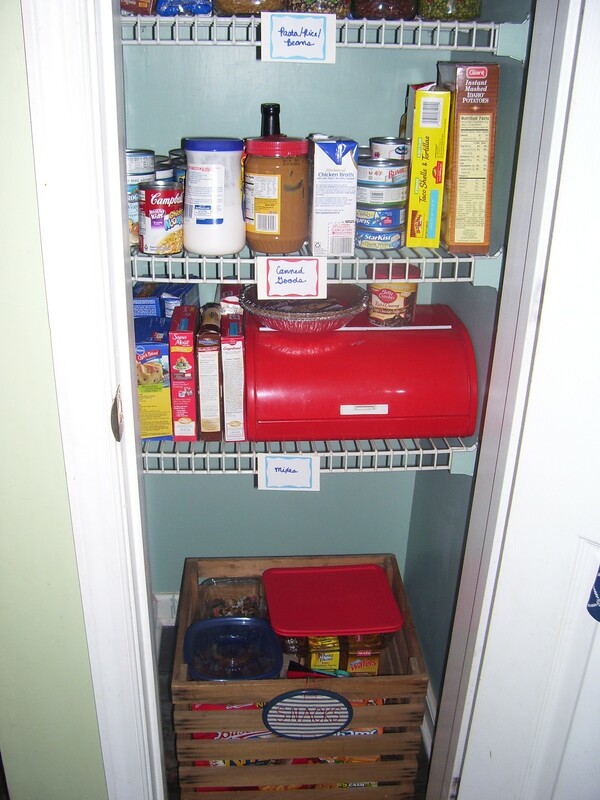 I’ll be quite transparent here–my pantry has needed an overhaul for a long time now. It was one of those “I’ll get around to it” projects for me for quite some time. We’ve lived in our home for over 12 years now and I’ve probably never totally taken everything out at once and given it an overhaul. Well, I got the incentive I needed when the CSI Project (thecsiproject.com) announced that this week’s challenge was to make over a pantry or closet of some kind. So, I rolled up my sleeves, put my grungy work clothes on, and took on the challenge. 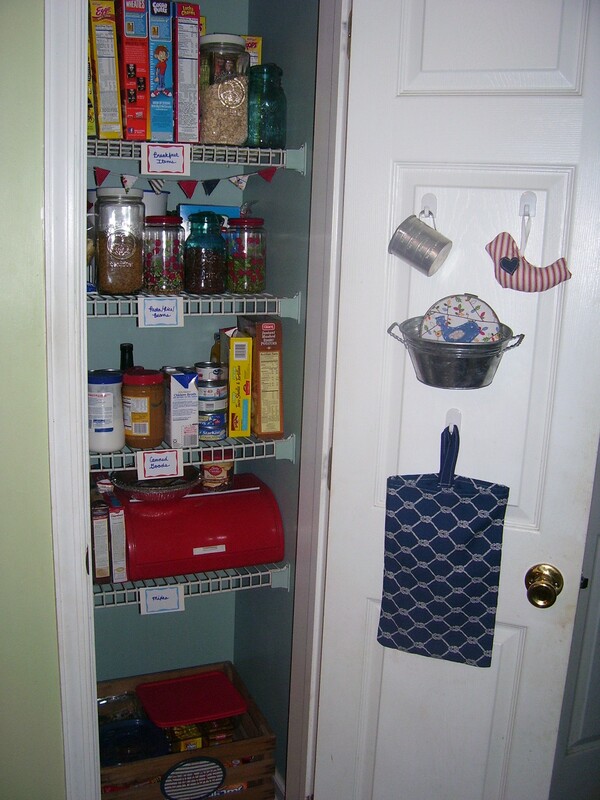 My newly painted, cleaned up, organized, and prettied up pantry. Now, you can’t really appreciate the after until you’ve seen the before, right? I also had piles of bags and boxes all over the floor in a big ole’ jumble. The only thing I really loved about my “before” is the cute grocery bag holder. 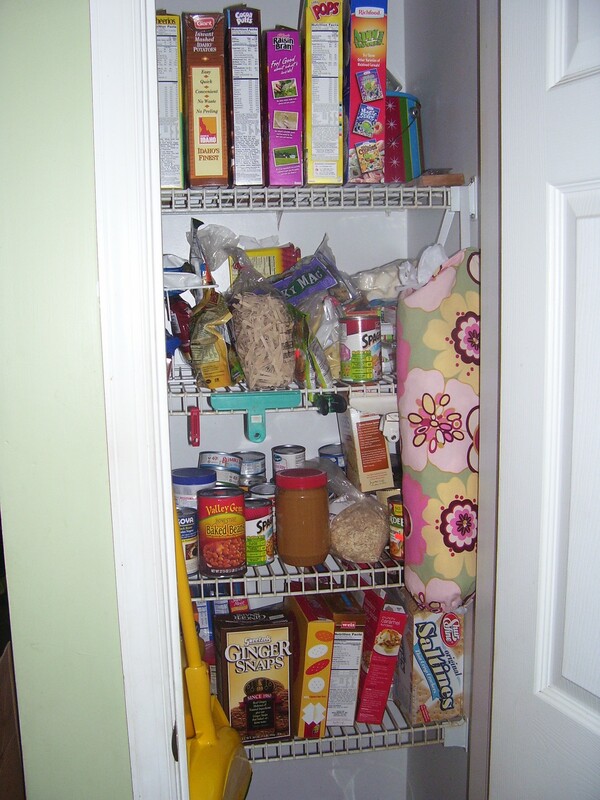 The inside of the pantry door. 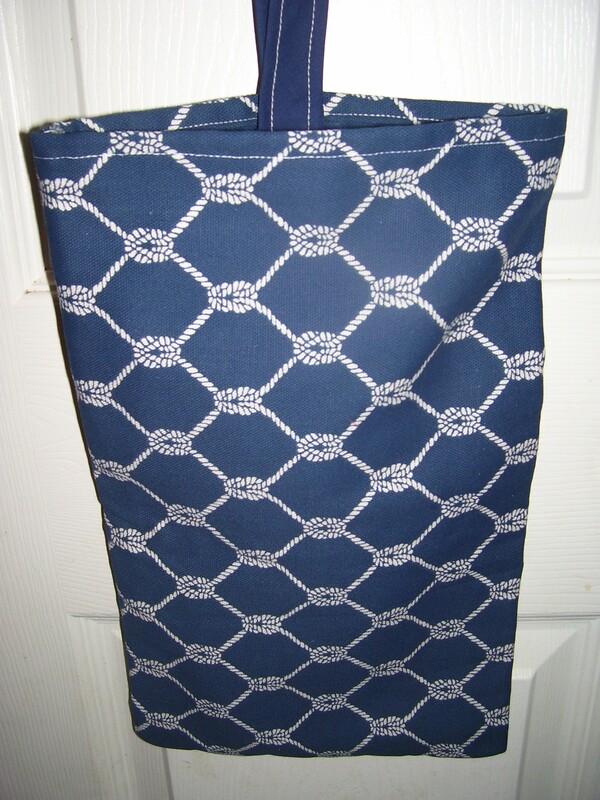 I sewed up a new grocery bag holder to match. 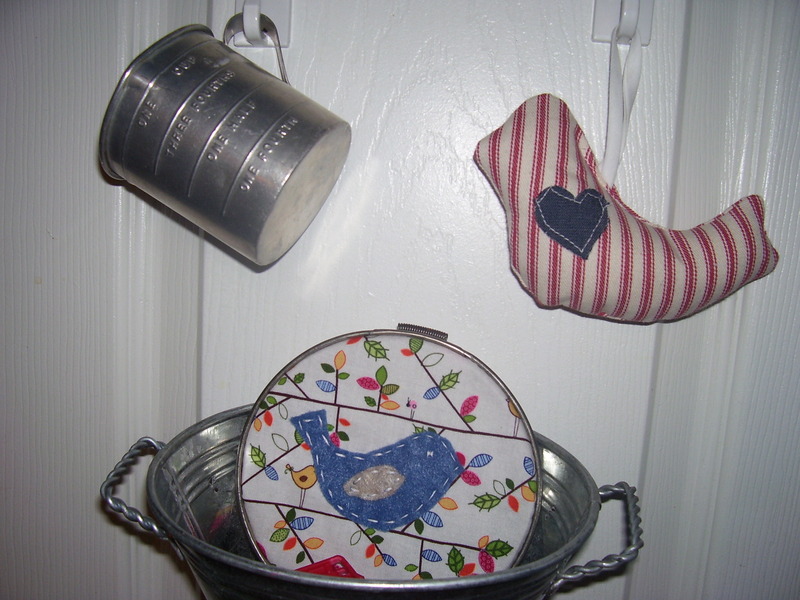 A thrifted tin measuring cup, a ticking birdie that I made, and a tin container to hold my bag clips. 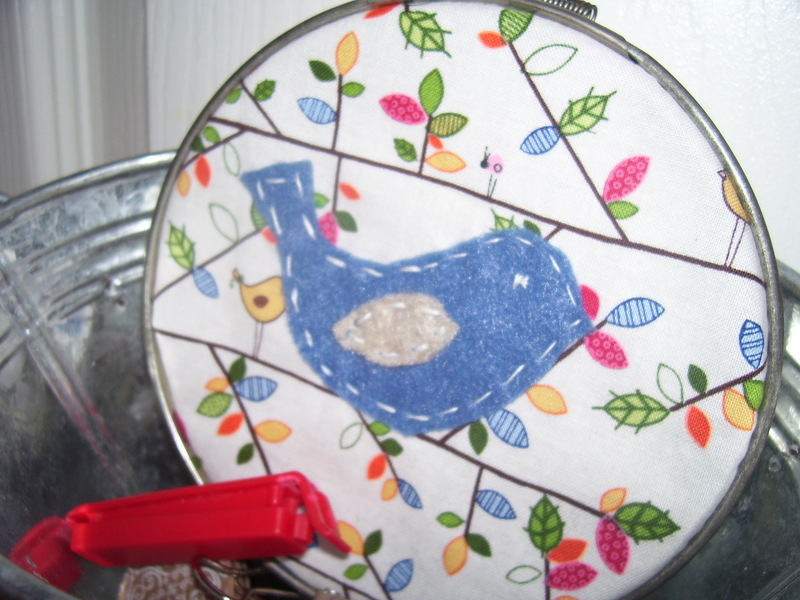 Resting inside of that is an antique embroidery hoop with a fabric & felt bird picture. 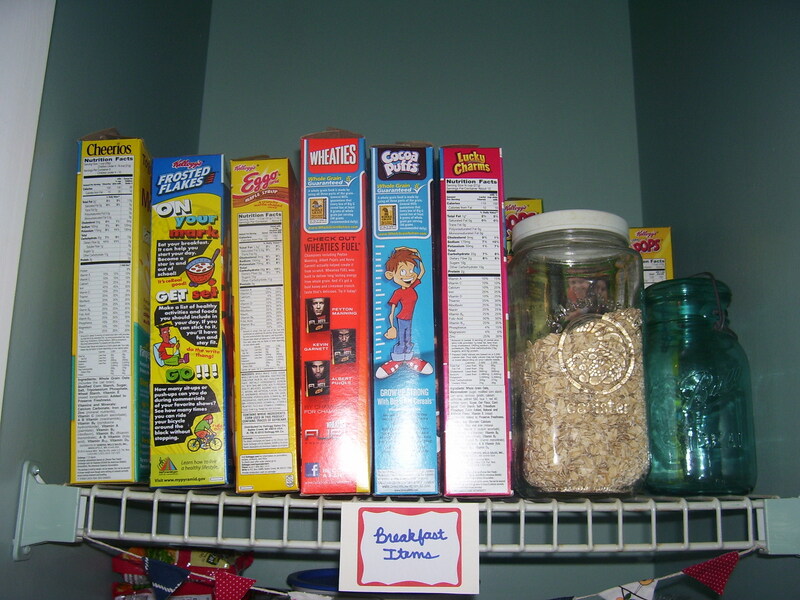 The very top shelf, holding cereals and breakfast items. The 2nd shelf down containing pastas, rice, and beans. 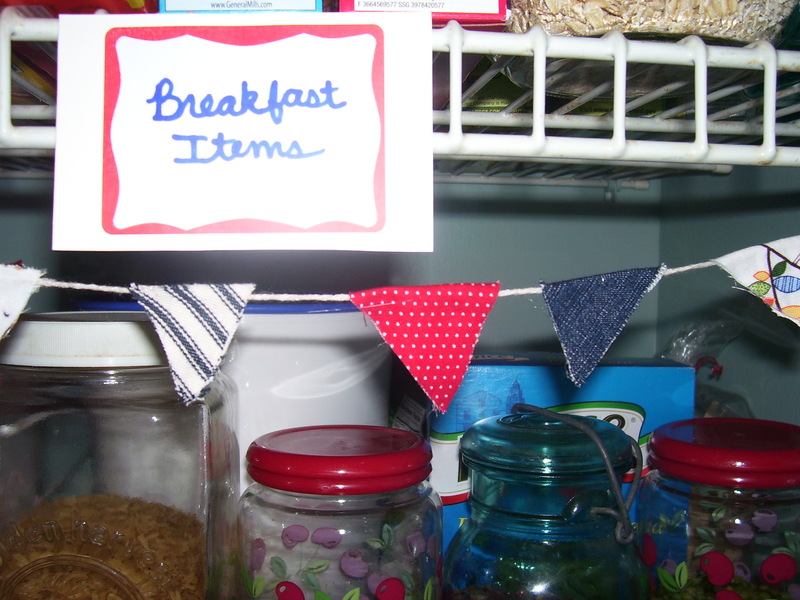 I used clearance decorative canisters as well as old Blue Ball Mason jars. A closer peek at my homemade bunting--I simply took coordinating fabrics to tie everything together, cut triangle shapes, and hot-glued them onto a piece of twine. 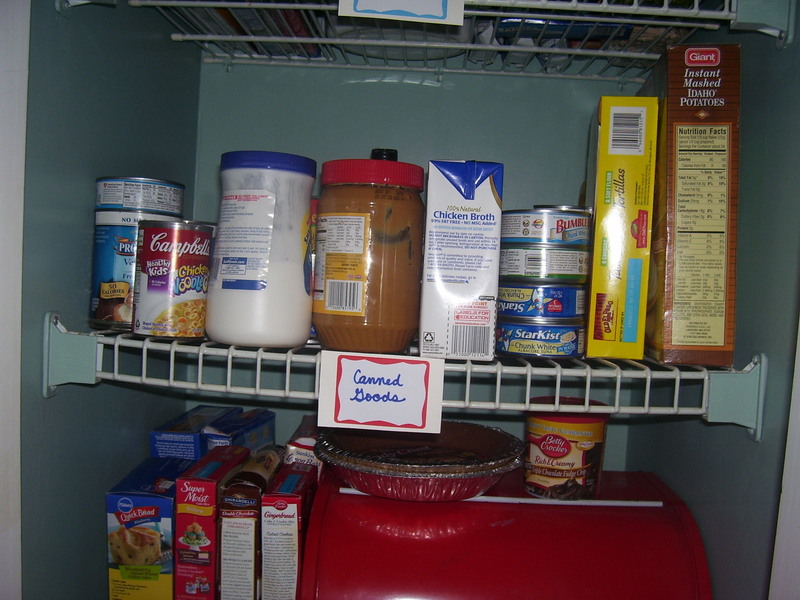 The 3rd shelf down containing canned goods, peanut butter, etc. 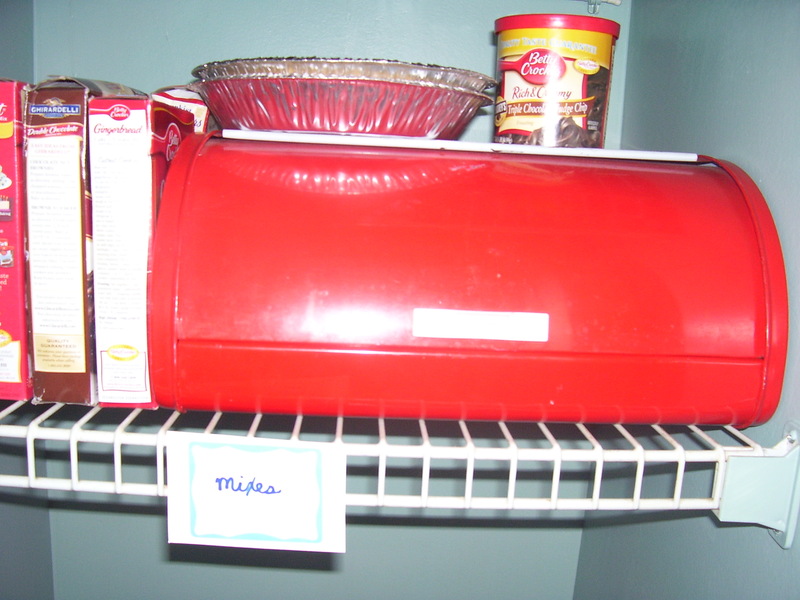 I am so thrilled about this vintage tin bread box, already in a glossy red color--perfect! 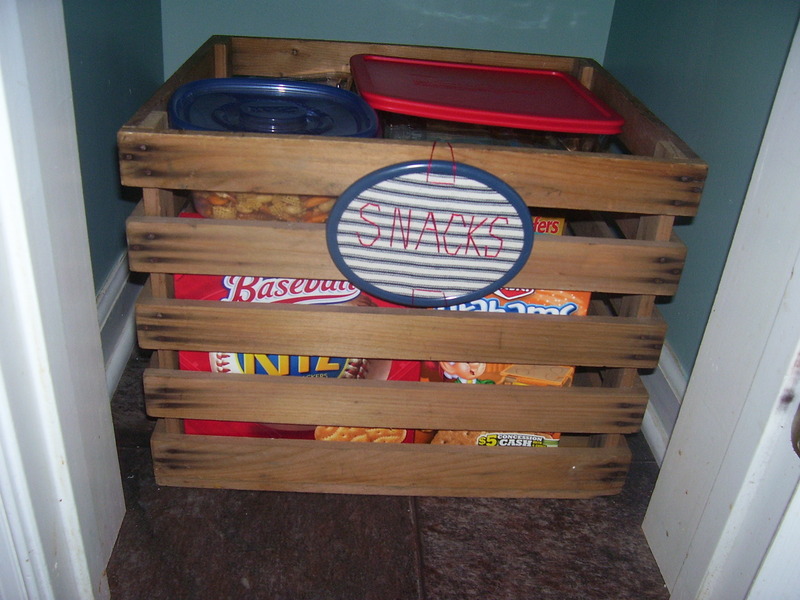 An old wooden apple crate sits on the floor and holds all of the kids' snacks. 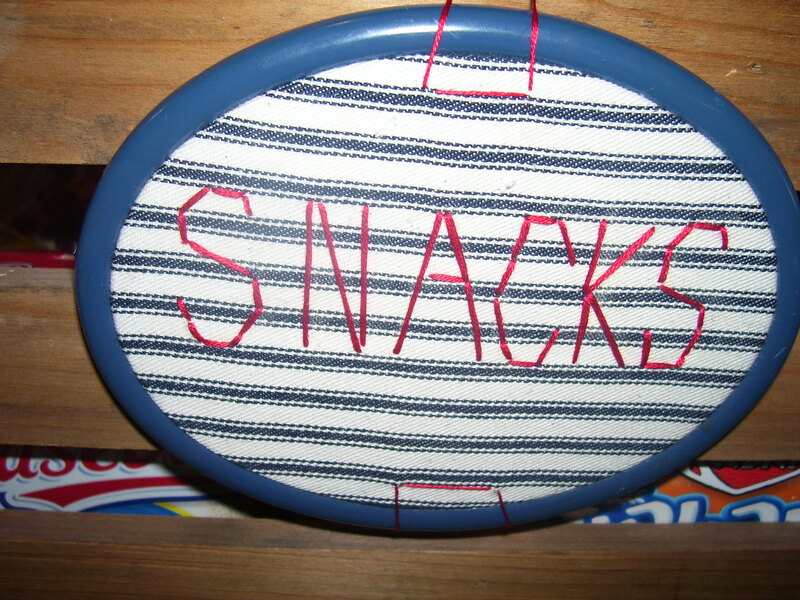 Probably my most favorite detail is this vintage embroidery frame that I put a piece of blue ticking in and embroidered the word SNACKS in red. All in all, I am SO pleased with my new pantry. As I wrap this up, I also have to mention that I probably spent, at most, $10 on this makeover. The most expensive item was the cool tin bread box, which I got for $6 at an antique shop. Pretty much everything else I already had or made from something I already had. Oh, how I love to make something brand new without buying or spending much! So, what do you think? 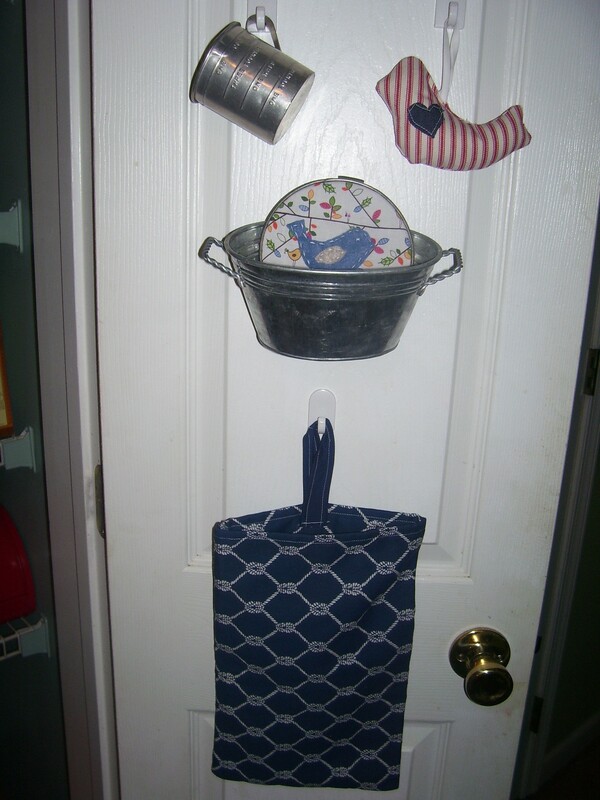 I hung a cotton canvas shoe holder on the back of my pantry door. I use it to hold things like kool aid packets, spice packets and gravy packets. I adore your breadbox. I have a turquoise in my kitchen, but it is so not as cute as yours. 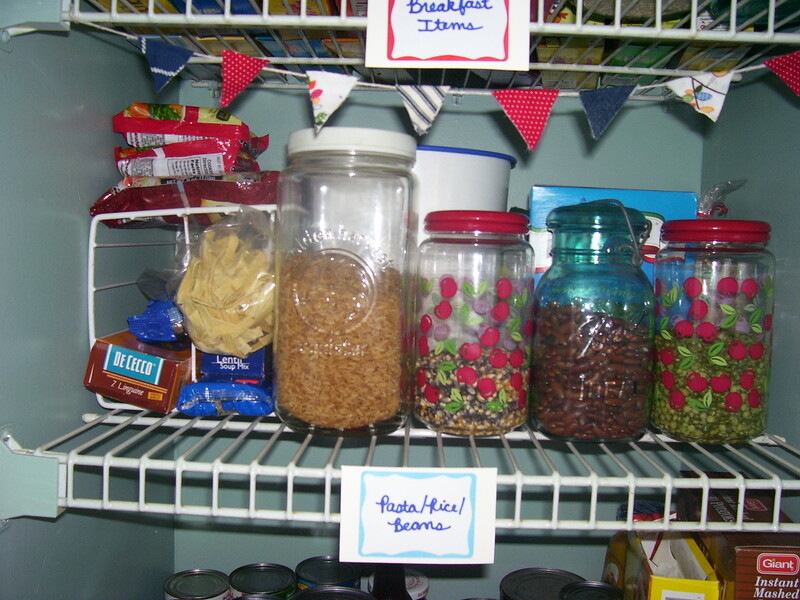 I love the mason jars in the pantry. It adds a fun factor. Fantastic job. I think I need a pantry to spruce up.